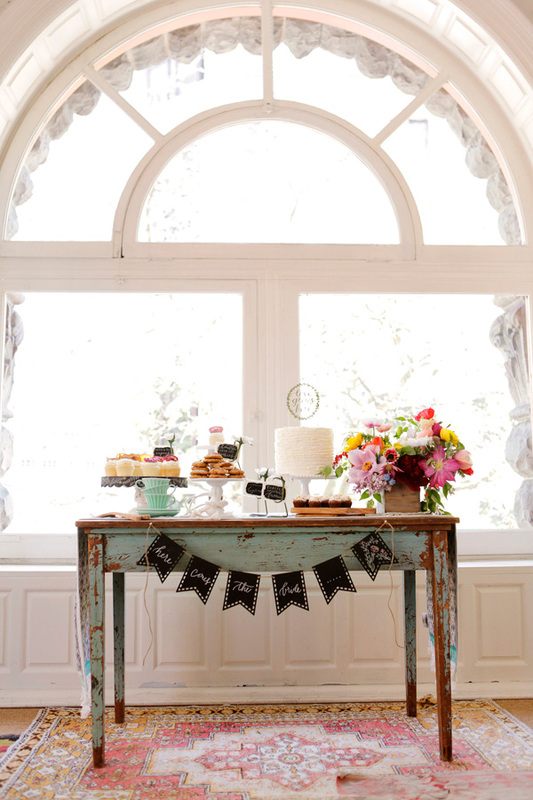 SCOUT blog : Jenn Elliott Blake | A BHLDN Inspired Bridal Shower. 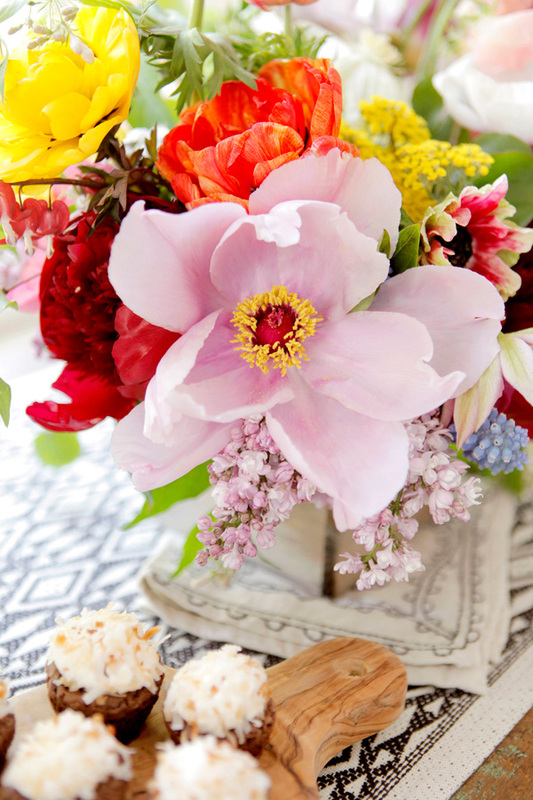 A BHLDN Inspired Bridal Shower. When BHLDN reached out a couple of months back and asked me to highlight some of their spring/summer decor collection in a bridal shower inspired shoot, I couldn’t be more excited about the possibilities! They sent along a product-board of the items they desired me to highlight and I got to work brainstorming potential ideas. 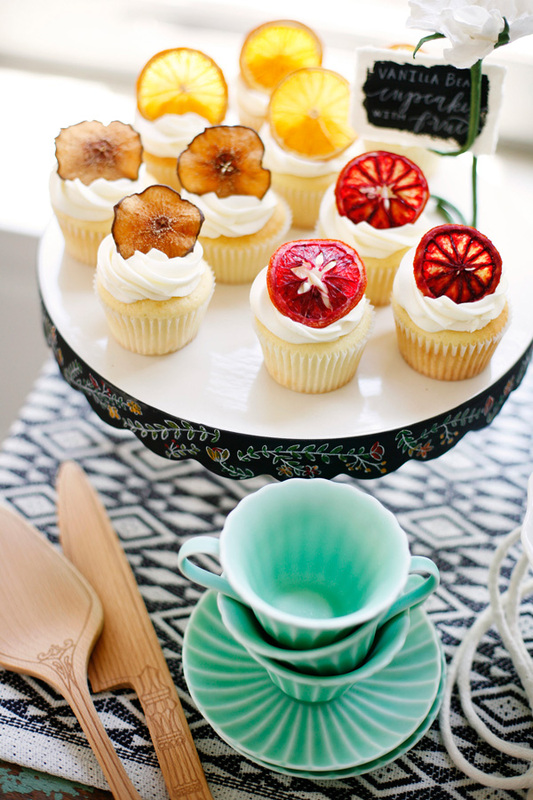 When it comes to styling events, bridal showers are absolutely one of the most thrilling and fun ones to plan. 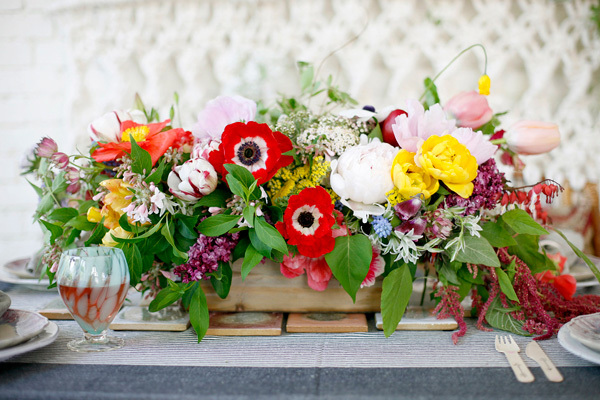 There are SO many potential possibilities with all sorts of themes, color palettes and places to look for inspiration, especially ones that will make the bride smile and reflect her style. For this particular shoot, I knew that BHLDN was eager for me to showcase their rustic/garden inspired products in a refined and polished way. I’ve really been itching for summer to turn the corner as well, so I wanted the shoot to be full of bold pops of color and perfect for a backyard or indoor affair. After sorting through the items they sent I was immediately inspired by the rustic charm of BHLDN’s wooden box planters. I spent the morning before the day of the shoot at the local growers market picking out the most stunning and seasonal florals I could find. 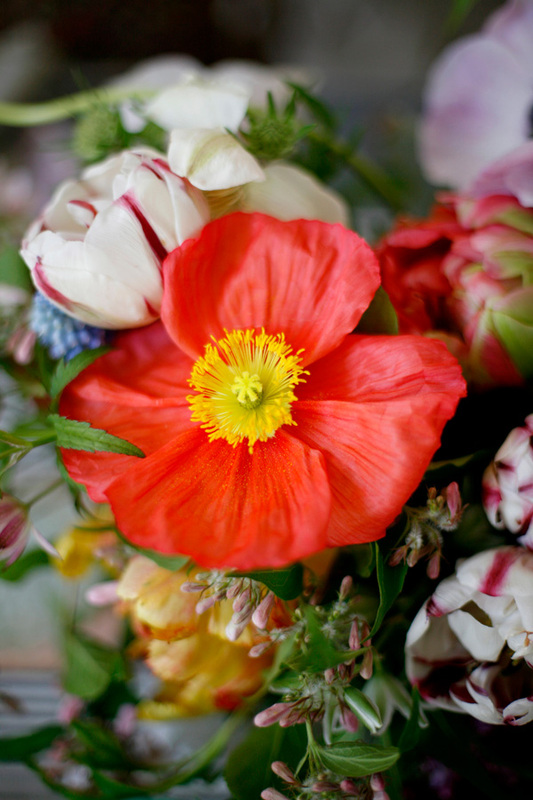 Peonies, tulips, anemones, poppies, and a whole plethora of other pretties helped to create really robust and bountiful arrangements. Floral design is quickly becoming my new favorite thing to do in my spare time and while styling, and these arrangements made me happy from start to finish. 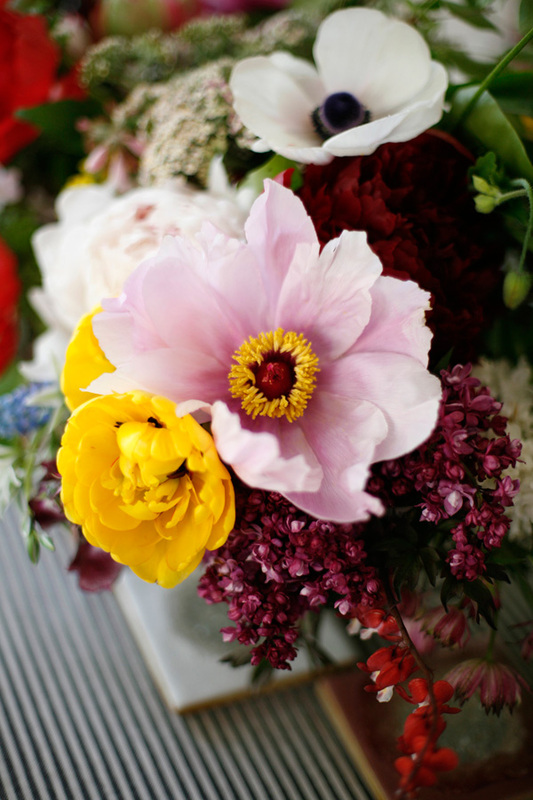 Flowers are always such a simple and natural way to create texture and dimension at parties and are perfect for bridal showers! 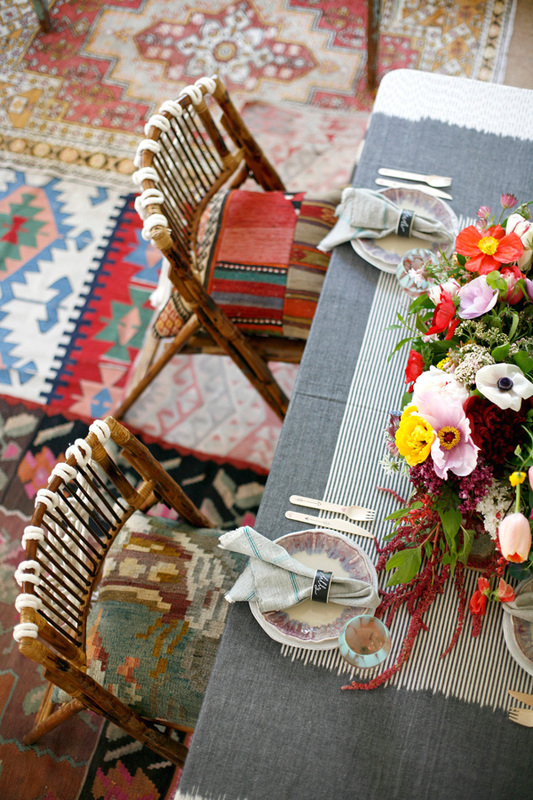 I love how the flowers bold colors play off the bohemian vibe of all of the rugs and additional decor elements. 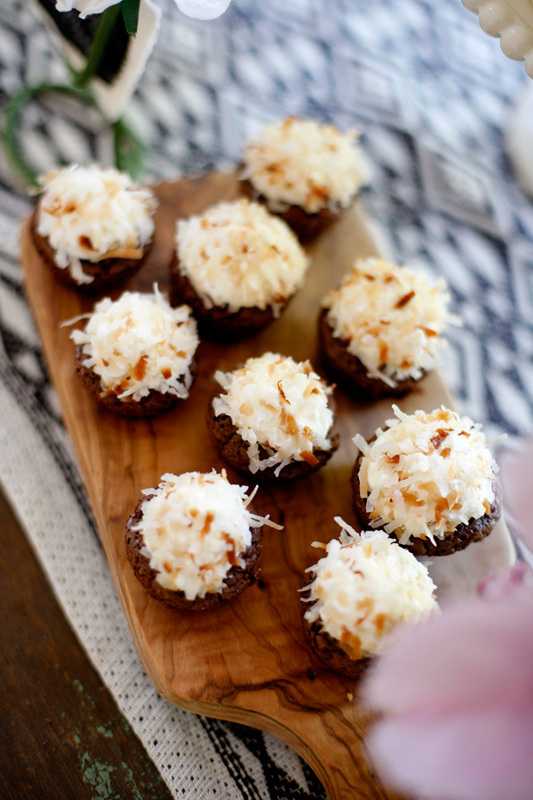 No party and certainly no bridal shower is complete without something sweet, right?! Thankfully Jenny over at Jenny Cookies created the most wonderful desserts complete with a pretty single tall tiered cake topped with BHLDN’s “love grows here” cake topper, homemade cranberry oat cookies, coconut brownie bites and the most darling cupcakes with Simple and Crisp dried fruits on top. The fruit was an absolutely genius way to play into the color palette of the shoot and the organic garden vibe of the day. 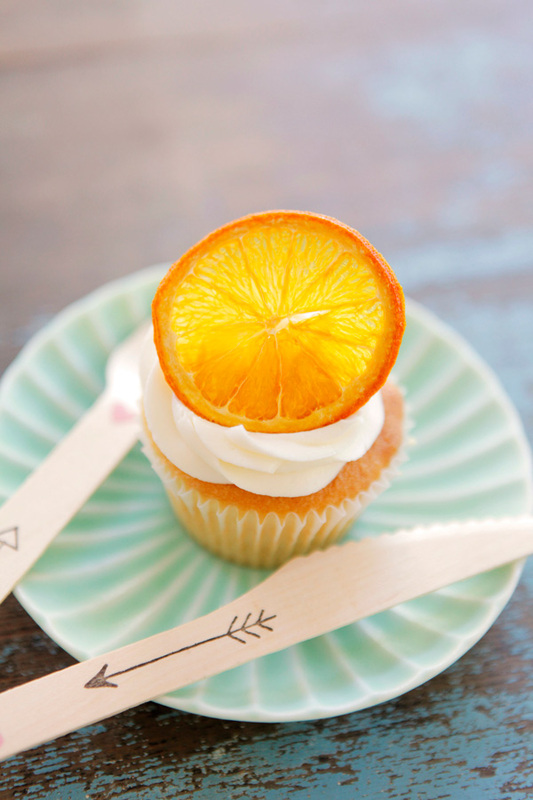 All of the desserts were labeled using mulberry bark place cards and chalkboard paint thanks to Sally of La Happy. 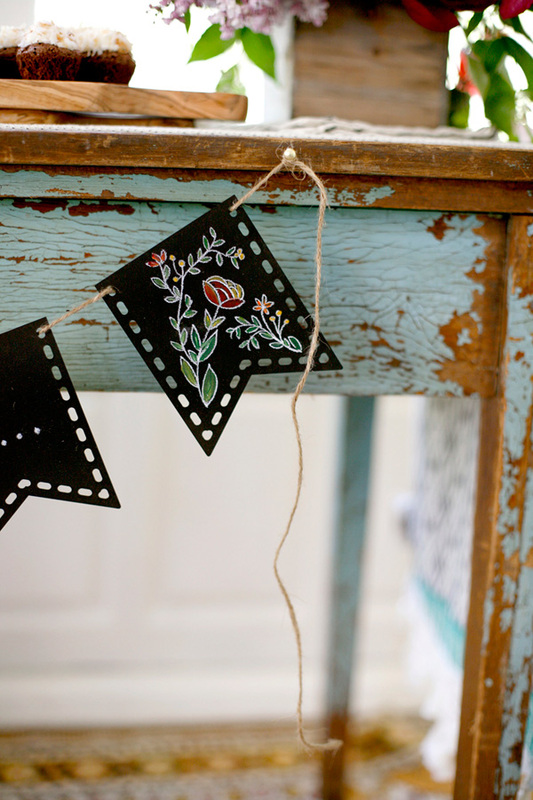 I loved how Sally painted the stark white tags to play off of the other chalkboard elements from BHLDN’s line including the chalkboard cake stand, and the wooden chalkboard pennants. Sally even hand painted floral garland on the cake stand, pennants and the chalkboard napkin rings!! 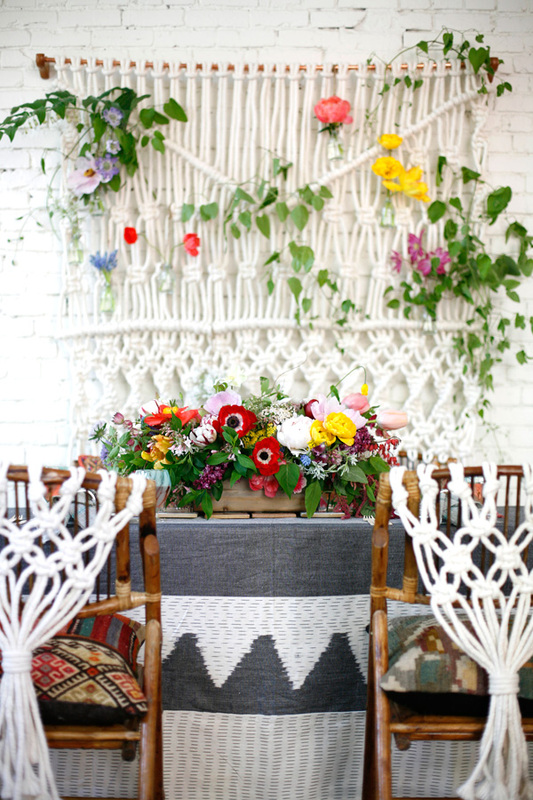 SO SO gorgeous and such a great way to bring bohemian style into the shoot! 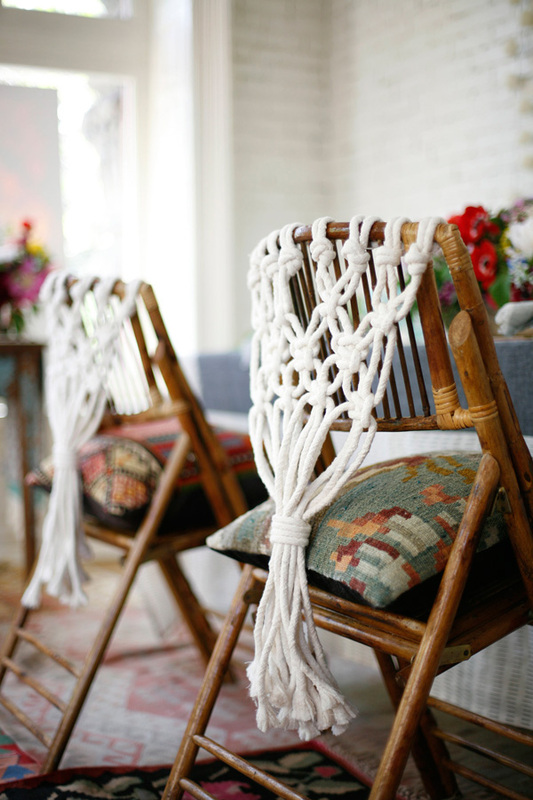 I loved these bamboo chairs from ABC Rentals by Cort and had so much fun creating the custom macrame hangers for each chair. The pretty rugs and pillows were sourced from Leslie over at Anima Mundi in Ballard and Turabi Rug Gallery in Pioneer Square. If you ever have a chance to visit Seattle, you MUST stop into these shops! Such an amazing selection of beautiful textiles to choose from and I’m certainly headed back to both during the process of our house remodel. All day throughout the shoot everyone on set kept saying how much they wished they could “live here”. I’m seriously considering the rug layering I did for this shoot to become an absolute staple in our new house! I was like a kid in a candy store the day I went to hand-pick the selection for this shoot – love all the fun patterns of the rugs! 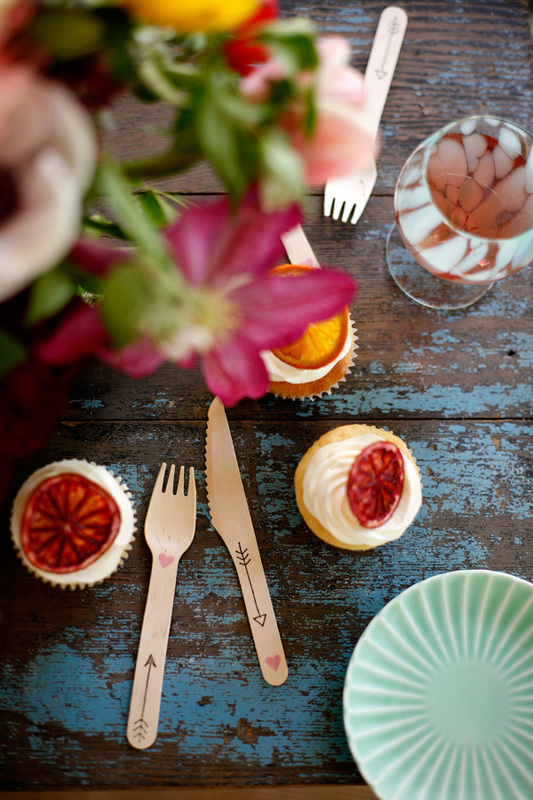 The gorgeous rustic tables were sourced from Beckie over at Vintage Ambiance - she has the most wonderful selection of vintage pieces and her collection was the perfect way to showcase all of the desserts & sweets. 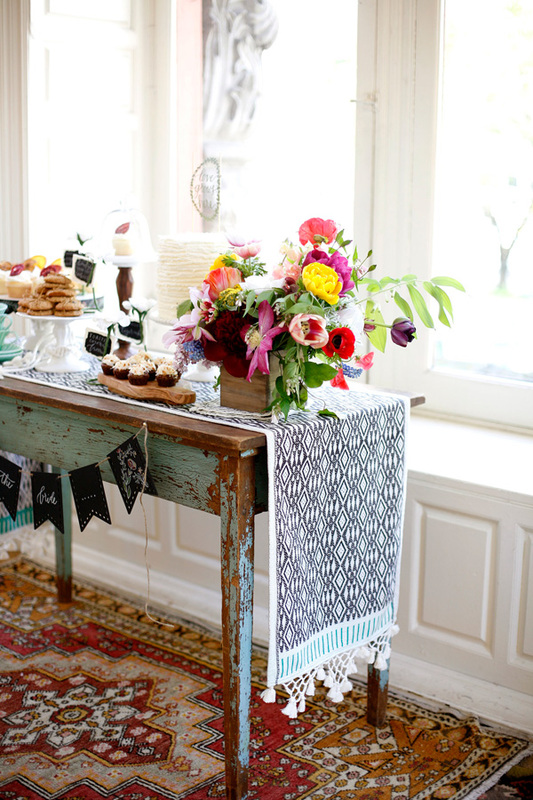 This turquoise patina table worked so well paired with the pretty floral paintings by Sally on BHLDN’s chalkboard pennants. 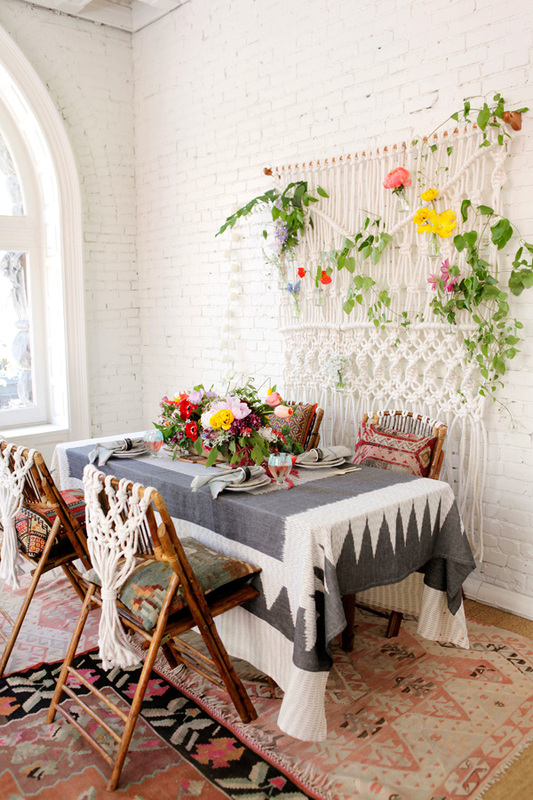 I’ve been on a serious boho kick lately and haven’t stopped thinking about how fun macrame is. I’ve always been inspired by its 70′s retro charm even using it as inspiration for a shoot I directed and styled a couple years back. I definitely wanted it to be a main focal point for this shower theme. BUT : one teensy-itsy-bitsy tiny problem. I didn’t know how to macrame my vision to life. Thankfully my mom is a full fledged hippie at heart and a wizard at whipping up pretty much any project she puts her mind to. 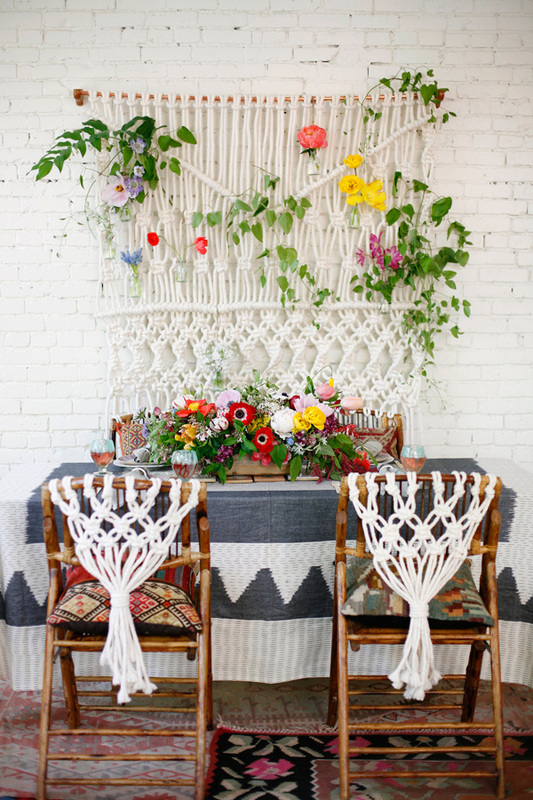 I told her my idea for the macrame backdrop which could include BHLDN’S pretty hanging bud vases from it, and my ideas for incorporating macrame throughout the shoot including chair hangings and sleeves for the cake stands. Not two days later I was flying out to Denver, and we spent 24 hours straight crafting the macrame backdrop you see here. I stuffed the entire thing into a small carry on suitcase and brought it straight back to Seattle a few days before the shoot. 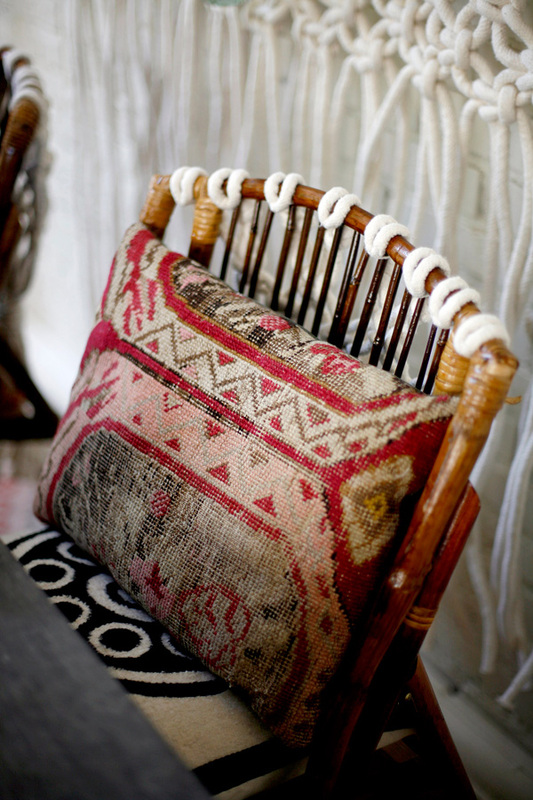 I’m so so thankful to my Mom for being such an amazing assistant and even more thrilled that I now know how to whip up one of these macrame beauties in no time! The dessert table was overflowing with pretty decor from BHLDN including the beech wood cake serving set, revelry cake stands, their flower tag holders and more. I also pulled in some pretty details from Anthropologie including their cumulus glassware, majorelle teacups and saucers, and netted fringe table runner to help accentuate the style. I feel so blessed to have had Dorothee by my side throughout the day to capture all of the details. She is such a joy to work with and she always does the best job in bringing a story or concept to life. I can’t speak enough to the importance and value in working with people you love and who love you back. Dorothee made what could have been a stressful day of setup, something fun and exciting – hallelujah! 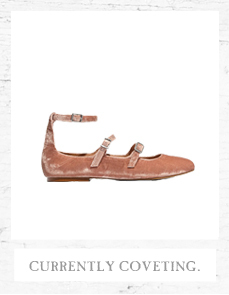 Also, a big hug to my friend Jess for all her help in sourcing some of the Anthropologie products you see here. She was invaluable in getting those smoke ring plates sourced from NYC when I couldn’t find them anywhere else. Hands down one of the most important parts of creating a really beautiful party setting is the location. Location, location, location! A space that provides a beautiful, yet non-competing foundation for your party design is always ideal. I was SO in love with the location of our shoot : 95 Yesler. The space is located in the Pioneer Square area of Seattle and also houses the workspaces of some of my dearest Seattle friends. Good news is the space is available for rent for events and parties, so if you’re looking for a great space to celebrate in and are local to Seattle, be sure to check out their killer space! Aren’t those windows unbelievable?!! One of the largest fallacies in event or party planning is that great experiences and beautiful images are made possible by the ideas and workings of one single person. I often sit down with clients who have the expectation that they are going to recreate an image they found online with little regard or understanding that it likely took 5-10-13+ people to make that image happen especially on a wedding day. This bridal shower would never have come to life without the amazing help of so many people I admire. The creative community here in Seattle is always so giving and the talent is phenomenal – each of the folks that contributed to this shoot are so passionate about what they do and their kindness and hard work are evident throughout all of the details. Thank you to Sally, Jenny, Dorothee, Beckie, Jess, Cass, Leslie, and the kind folks at Simple & Crisp and Turabi Rug Gallery for helping bring my vision to life. Couldn’t have done it without you! 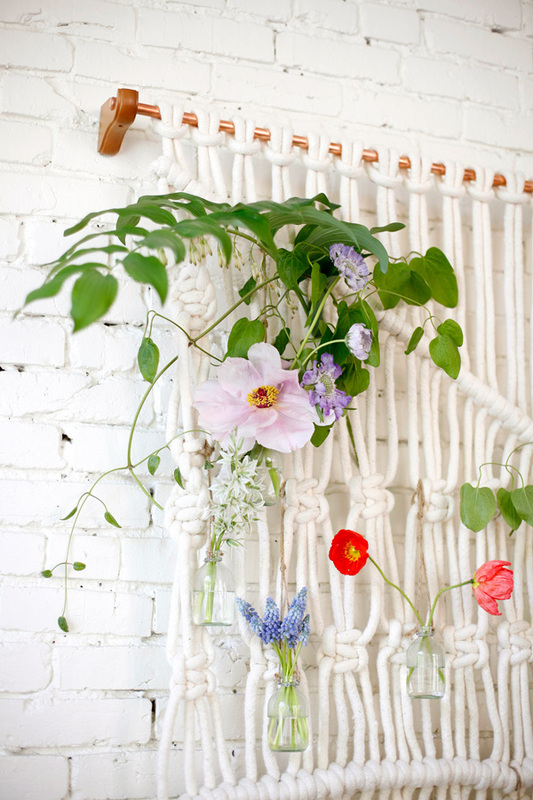 Tomorrow I’ll be announcing a giveaway of some of the fun BHLDN products you see in this shoot! Head back to the blog tomorrow for details! You can also see this shoot as well as other’s to inspire your upcoming event highlighted on BHLDN’s blog here today! 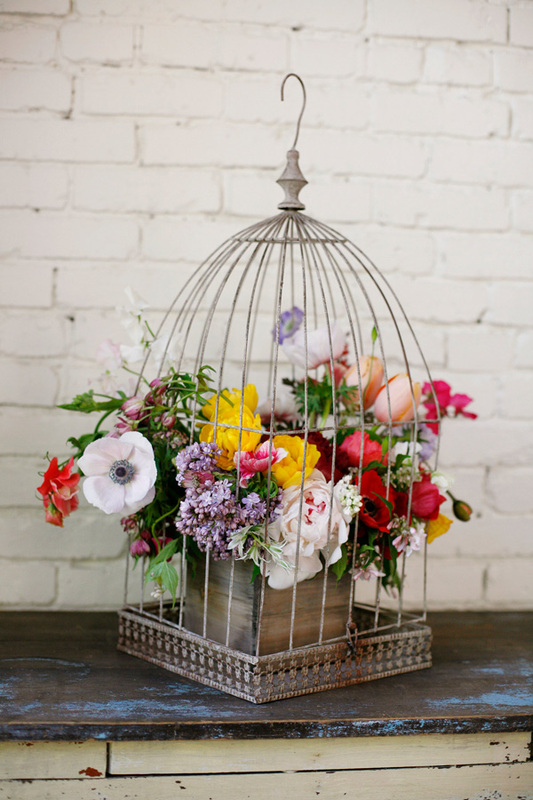 This post was created in partnership with BHLDN. All thoughts and opinions are my own. Jenn, all I can say is stunning! Wow – so colorful and charming. 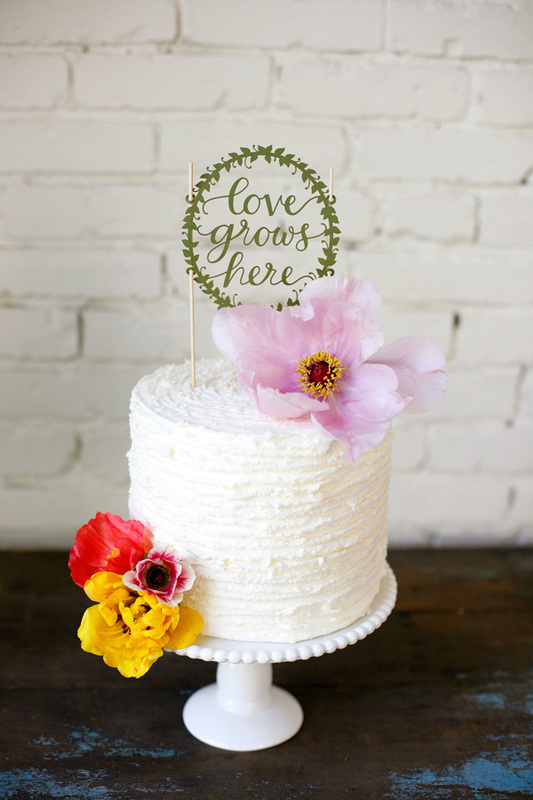 I love that cake topper and all of the gorgeous flowers. 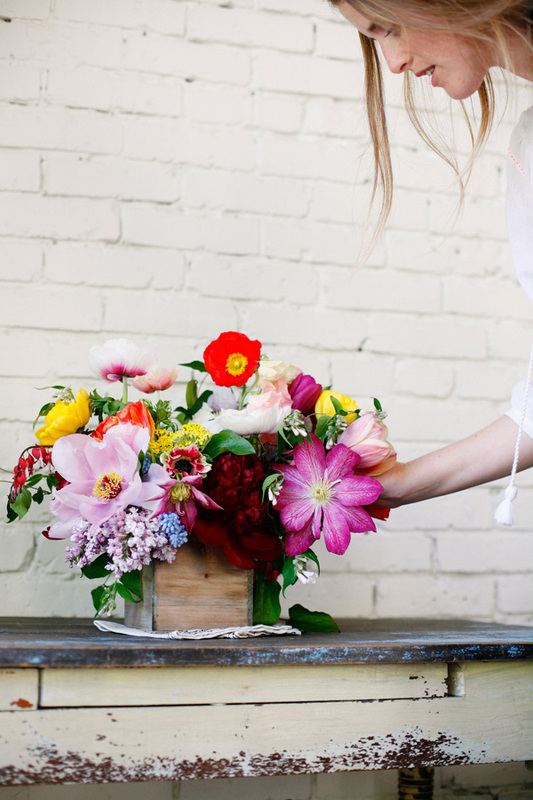 SCOUT blog : Jenn Elliott Blake | A BHLDN Giveaway + Happy Weekend! Jenn, you nailed it! I’m dying over these details. Especially the flowers. 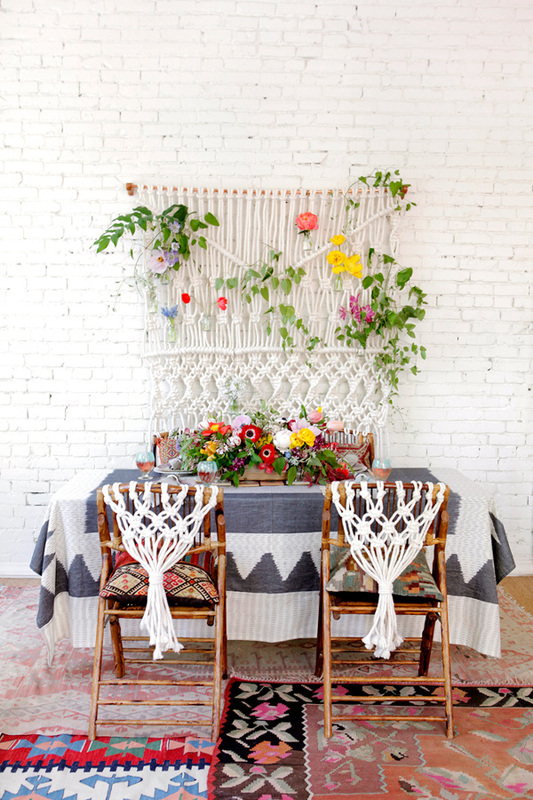 And the macrame is genius. You!!!! !